since many are running the below story in various forms this week, I found this one to cover most of the topic. As I watched the short video in the beginning and read the article, it was refreshing to see as it is seldom pointed out. It shows that only so much water can be released from the Mosses Saunders dam or Montreal and all the other areas built on an established flood plain will flood. 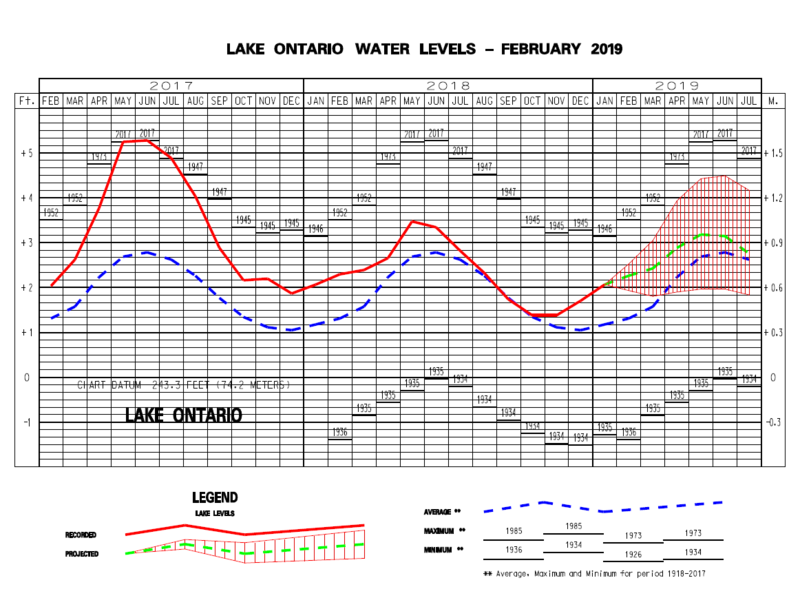 What is not comforting about the current situation is the lake level is currently higher this year than compared to the same reporting period back in 2017, The amount of water being released this year is higher than it was back in 2017. Also mentioned is, Montreal and the surrounding area has already seen an inordinate amount of precipitation which does not make for a good case of releasing more water from the Mosses Saunders dam once spring comes later-similar to 2017. Updated forecast for 2019 & Experimental 5 year forecast from the Army Corps of Engineers. Since the last reading I have watched the lake level actually dip lower this last week, checking weather and wind direction and they do not play into this. Which would mean that the record amount of water being released by the IJC is working but will it last ? This weekend warm weather will start the spring thaw and could cause the IJC to slow the release of water as areas ( ie Montreal ) downstream of the Mosses Saunders dam may yet again experience flooding in the coming weeks. Will know better this Monday/Tuesday after all the rain and warm temperatures coming this weekend, it will most likely will inch up a bit. Since the last reading and even within the last 24 hours, the lake level has been bobbing up and down erratically due to the weather. In the last 24 hours it was as low as 74.886 M to a height of 75.111 M happening just a few hours apart. Yesterday’s storm is certain to add more water to the Lake Ontario basin. The Great Lakes region is warming faster than the rest of the U.S., a trend that is likely to bring more extreme storms while also degrading water quality, worsening erosion and posing tougher challenges for farming, scientists report. In a report commissioned by the Chicago-based Environmental Law & Policy Center, the annual mean air temperature in the region increased 0.89 C in the periods 1901-60 and 1985-2016 — compared to 0.67 C for the rest of U.S. The region includes portions of the U.S. Midwest, Northeast and southern Canada. Warming is expected to continue this century, with rates depending on how much heat-trapping gases — like carbon dioxide and methane — are pumped into the atmosphere. As the air warms, it will hold more moisture, which will likely mean heavier winter snowstorms and spring rains. There could also be more flooding in vulnerable areas. Not only that, summers will be hotter and drier. "Over the last two centuries, the Great Lakes have been significantly impacted by human activity, and climate change is now adding more challenges and another layer of stress," said Don Weubbles, an atmospheric scientist at the University of Illinois and former assistant director of the Office of Science and Technology Policy in the Obama administration. "This report paints a stark picture of changes in store for the lake as a result of our changing climate." There were 18 scientists who produced the report, most from midwestern universities and the National Oceanic and Atmospheric Administration. 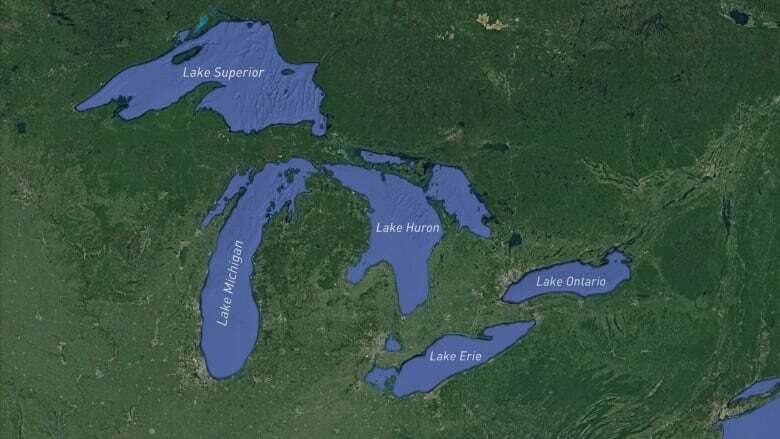 The Great Lakes hold about one-fifth of the world's surface fresh water. They are so large that they influence regional weather. The lakes keep nearby regions cooler in the summer and warmer in the winter, when compared regions farther inland. The humidity of the lakes also fuels the "lake-effect" snowfall and summer rains. Not only do the lakes provide drinking water for millions of people, they are the backbone of an economy built on manufacturing, agriculture and tourism. Record-high lake levels combined with years of damage along the shoreline mean the homes along the lake are literally on the edge. The local conservation authority expects Lake Erie water levels to surpass records set in 1996 and 1998. According to Tim Byrne, director of watershed management services with the Essex Region Conservation Authority, the water levels have been high for the last four or five years, which has exacerbated the erosion of the shoreline. "We could see significant portions of the lake road lost in Chatham-Kent," said Byrne, adding that all shoreline along Lake Erie — on both the mainland and on Pelee Island — is in rough shape. "In some locations the lake has embedded the rock [that fell away] and built upon to stabilize, especially the west coast of Pelee Island," said Byrne.Shoreline protection plans for the west coast of the island alone will cost close to $15 million. Where I am going with this is before we rebuild and put down some fortifications let’s remember where the old established shoreline is. This is what all our infrastructure was built around and that current lake level is not the norm as put to us by the IJC. Its great the city is going to make repairs taking money from my left pocket, province from my right and now the Feds from my back pocket but it will be money wasted if the underlying problem is not addressed and fixed. So can we ask the Feds to instead use the money from my back pocket and start working with the City of Montreal, province of Quebec and stop allowing growth to be built on an established flood plain along the St Lawrence. Purchase these homes, business and vacant properties - turn the lands into park lands void of any human inhabitants so that there is a less obstructed spillway for the Mosses Saunders dam. One statement that the IJC kept repeating during the flooding of 2017 was that they could not release more water from Lake Ontario or it would cause more flooding around the Montreal area instead the shoreline of Lake Ontario took the beating. 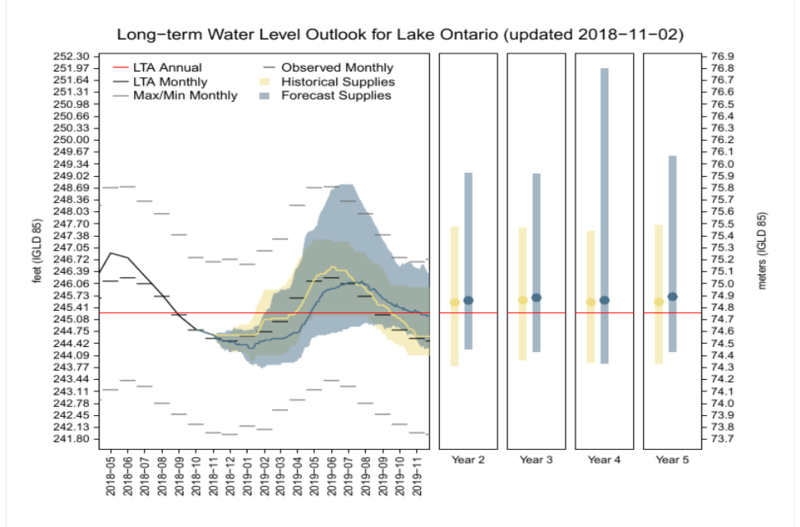 The IJC has since been great to report every so often that they are releasing record amounts of water from Lake Ontario but it is still not enough. The federal government has announced $12.7 million in funding for shoreline rehabilitation in Hamilton, to help rebuild after extreme storms battered the edge of the harbour in recent years. Infrastructure and Communities Minister Francois Phillipe Champagne made the announcement Thursday, telling reporters at the Woodward Wastewater Treatment Plant that funding will be used to combat damage from extreme storms brought on by climate change. "We've seen storms and rising water levels in Hamilton," Champagne said. "These extreme weather events are not just stronger, but more frequent. This is real." Sections of the Waterfront Trail were completely washed away and closed for months both in 2017 and 2018 after surging water levels brought on by storms wreaked havoc on the well-loved Hamilton trail. "Entire pieces of the shoreline ended up in the lake," said Cynthia Graham, the city's manager of landscape architectural services. City staffers have estimated cleanup and protection of the city's shoreline would cost $30 million. The federal government said in a news release the city will provide the remainder of the funding. Graham said the city plans to "armour the shoreline" with large stones to protect it from waves, alongside other measures that are still being worked out. "These areas of the city are some of the most valuable we have," she said. The government funding announced Friday will also be used for the installation of new backflow devices in the city's sewer system, which are designed to prevent lake and harbour water from entering sewers during extreme storms, and therefore lessen basement flooding. Extreme storms is recent years have caused flooding in homes in a number of city neighbourhoods. Flooding is an ongoing issue in the broader region,as well. In nearby Brantford, nearly 5,000 people ended up under an evacuation order in early 2018 after the Grand River flooded. Champagne said it's obvious that climate change is the root cause of these problems, and communities must "adapt to a sad and complex reality." "If we do not invest in disaster adaptation, we will need to invest in disaster remediation," he said. Climate change is an issue on which the federal and provincial governments don't seem to agree. Provincial Environment Minister Rod Phillips has vowed Ontario "will use every tool at our disposal to challenge" the federal Liberal government's carbon tax. "We don't need a carbon tax to fight climate change," he said as the new pan-Canadian policy took effect this week. Meanwhile, federal Environment Minister Catherine McKenna argues it's "challenging" to find one thing Ottawa and Ontario agree on when it comes to the new national climate change framework. "They've cut the programs that we were investing in energy efficiency. They're taking credit for what the previous government did on coal. They don't want to put a price on pollution. They're fighting us in court," she told CBC Radio's Metro Morning. When asked Thursday if the two levels of government are on the same page, Champagne totally dodged the question. "I'll certainly say the city gets it," Champagne said. "The people of Hamilton have seen the cost of inaction." I found this past article from 2017 during the Montreal flooding. It would be interesting to find out that after 2 years, has the CMM or Quebec Ministry of Environment if they finally updated the flood maps. What are flood maps, and why are they important? Used by urban planners and for disaster planning, it's critical to have up-to-date maps. Montreal doesn't. Flood maps are important tools for urban planners, civil security agencies and residents. They help home buyers measure the risk of owning properties on or near waterfront and help insurance companies calculate premiums for those properties. For all those reasons, it's important to have up-to-date flood maps that take into account climate patterns and changes to land use. How are flood maps made? To measure areas that are prone to flooding, complex calculations are made that take into account historical floods, changing river levels and flow rates, as well as the elevation of land. The 20-year floodplain, or zones that are likely to flood once every 20 years. The 100-year floodplain, those that are likely to flood once a century. Here's the current flood map for Cap-Saint-Jacques and L'Anse-à-l'Orme Nature Park in the West Island. The light red zone is the 20-year floodplain, and the dark red zone is the 100-year floodplain. Compare it with the actual extent of the recent floods, according to satellite images released by the Quebec government. There is no standard for the creation of flood maps in Quebec. In some cases, municipalities may commission their own maps. In other cases, they could be produced by the provincial government. For the Montreal area, they are made by the Montreal Metropolitan Community (CMM), a council that includes municipalities on the island of Montreal, Laval and on the South and North Shores. All flood maps in the province are collected and distributed by the Quebec Environment Ministry, which sells the digitized versions for $111. What kinds of flood maps are available in Montreal? Montreal's flood maps include very little data that is up-to-date and useful. The only maps that are current cover the Lake of Two Mountains and the Mille Îles River between Laval and the North Shore. 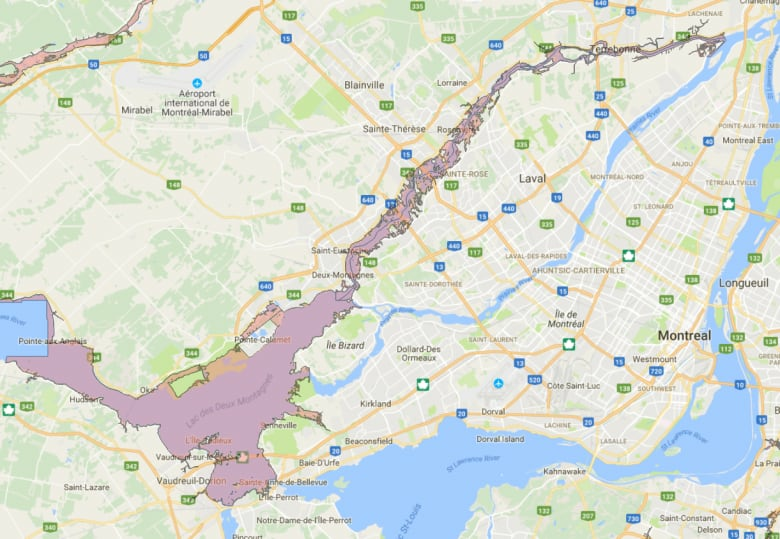 Flood information websites for both the City of Montreal and the Quebec government offer printable maps in PDF format for much of the Ottawa and St. Lawrence rivers. 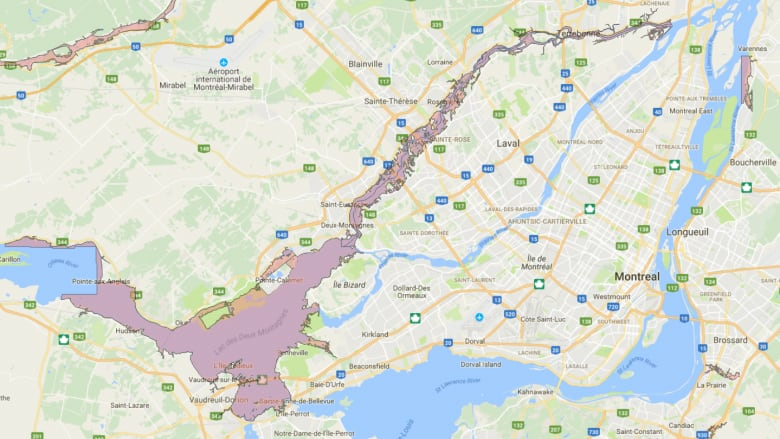 There are no flood maps for most of Montreal's shoreline. Another city website with flood information contains a map that is so small, it's impossible to see detailed floodplains. Compare this with public, easy-to-find flood maps for Manhattan and for all of France. The Quebec government does have archived flood maps for the Rivière des Prairies which the CBC obtained. They were created in the 1980s and taken out of circulation around 2006, when new studies on flood risks were done. But new maps have not been created for this area with the latest data, which is already 11 years old. So there are no maps for Pierrefonds. What information is available? The latest usable data are projections for how high the river would rise at these theoretical 20-year and 100-year periods. But these numbers are just the start; they're one of several ingredients for usable flood maps. The most recent projection of a major 100-year flood on the Rivière des Prairies predicts it could rise to 24.42 metres. 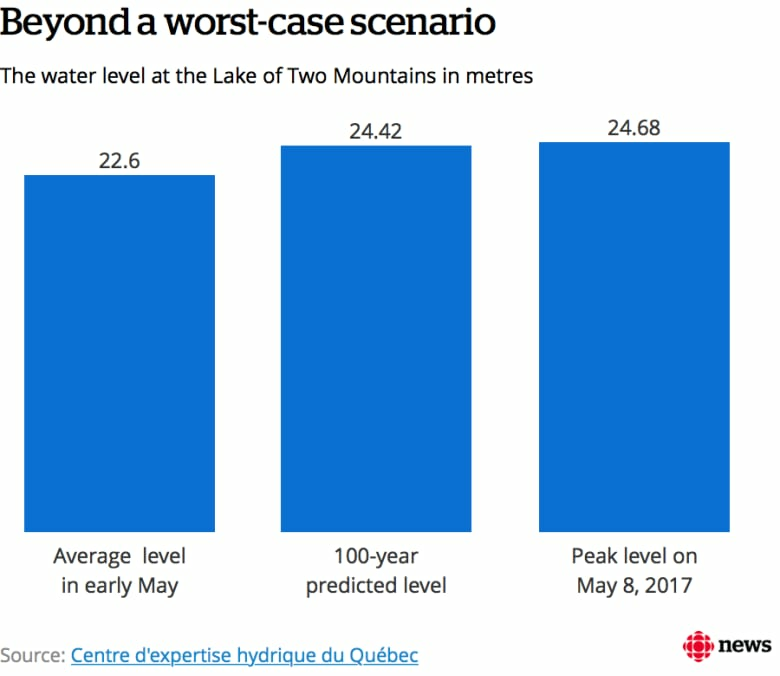 During the highest peak of the flood, on May 8, it rose more than 20 cm past that projection. walking down on the pier last night noticed the lake level is creeping up your "measuring stick". Taking a look at the Fisheries and Oceans web site, the lake level is rising since last Friday's read, current average is now 75.16 M. With another major weather soaker predicted for this week, it should send the level up even higher. Further downstream flooding has started in the Ottawa region which will mean the IJC will soon be slowing the discharge from the Mosses Saunders dam. to ease the flooding expected for the region and Montreal areas. I have gathered a few recent articles on what is happening down in the region. I was looking at that rail yesterday and yes, it is getting higher when in past years the level was starting to inch down at this time of the year. And lots wet weather coming, hopefully our Easter Hunt gets a pass. Assemblyman Will Barclay, R-Pulaski, said some residents and businesses still have not recovered from the last flood two years ago, and officials must do everything possible to ensure water levels do not reach flood stage again this year. Lake levels are about six inches higher than February 2017 and roughly three inches higher than this time in 2018, but regulators say the 2017 events were caused by heavy rainfall in April and May not high winter lake levels.